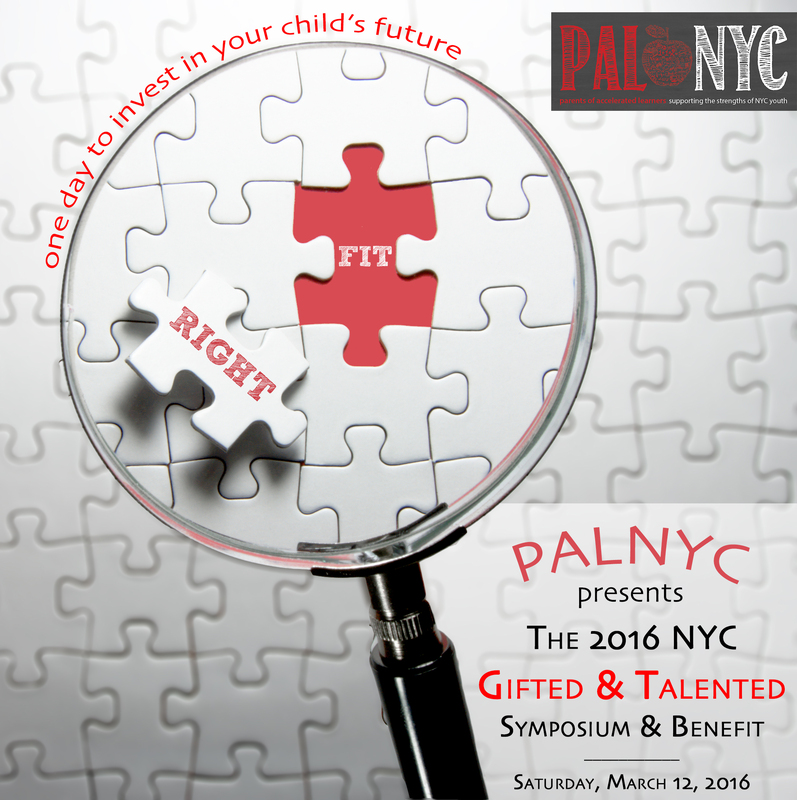 Mark your calendars for Saturday, March 12, 2016 and join PALNYC and our partners at the 2016 NYC Gifted & Talented Symposium & Benefit— one day to invest in your child’s future. 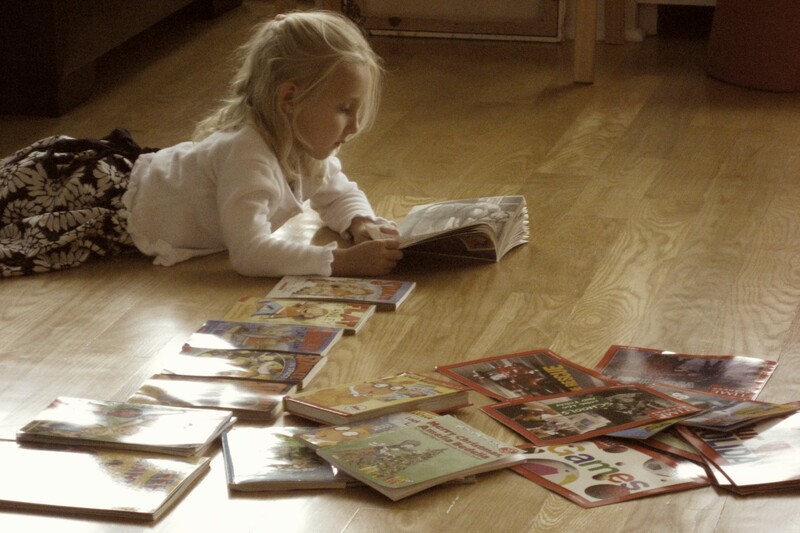 Want a richer understanding of what it means to support your advanced learner? Looking for innovative programs or services to challenge your child? Or just looking for great local & Ed Tech resources? The Parents of Accelerated Learners, NYC (PALNYC) is pleased to present the second biennial one-day symposium for parents, educators, education technology specialists and professionals, the 2016 NYC Gifted & Talented Symposium & Benefit on March 12, 2016. Featured presentations – ‘The Right Fit: Understanding & Supporting Your Child’s Strengths by Elaine Hansen of Johns Hopkins Center for Talented Youth & René Islas from NAGC on what the new ESSA means for advanced learners. A Thought Leaders Roundtable with NYC’s most knowledgable & influential leaders in education. 5 strands of sessions on the topics Talent Development, Social & Emotional, Special Topics, Navigating the NYC Process and Professional Developmentfor educator credit. A Curated Exhibit Hall with a sampling of NYC’s best schools, programs, services, products and an Ed Tech Showcase.Visit http://nycgt.sched.org/tickets to register. *early bird registration and donor discounts are available online for a limited time. Parents and educators, principals, mental health professionals, education researchers, ed tech specialists, consultants, school counselors, pediatricians and pediatric dentists, school nurses, and anyone who wants to join the conversation about supporting NYC’s high potential youth. The content is relevant for parents and professionals from Pre-K through middle school. A limited number of opportunities are available to attend the Symposium for free as a volunteer. The NYC Gifted & Talented Symposium & Benefit includes topics on talent development, social & emotional development and how to negotiate the practical matters for parents of high potential youth, including: The ABCs of Pre-K: Navigating Public & Private School Options • Intro to Social & Emotional Needs of High Ability Youth • The Gifted Ed Toolkit: A Beginners Guide to Your Advanced Learner, an exploration of gifted characteristics and identification • Twice Exceptional Learners: Support, Advocacy and Educational Options for 2E Kids • The Dog Ate My IPad: Executive Function & Organizational Skills for Middle Schoolers • The Flip Side of ‘Gifted’: Uneven, Unmotivated, Perfectionist & Anxious • S.T.E.M. Topics: Teaching Children to Think Mathematically • Navigating Elementary: Admissions & Testing for Public & Independent Schools • Transition Time & What to Do When It’s Not the Right Fit • Talent Development & Understanding Learning Styles • Supporting the Arts & 21st Century Skills • Navigating Middle School: Admissions, Testing & the Interview Process • Literacy & Critical Thinking • Navigating High School: Admissions, Testing & the Interview Process for Public, Independent, Specialized & Boarding and more! The Symposium will also offer educators an opportunity to attend sessions for CEU in the Professional Development strand. A sampling of sessions from the Professional Development Providing Rigor and Relevance in the Classroom by Elissa Brown, HUNTER College; Promoting Thinking in Content Areas through PerformanceBased Assessments by Brooke Kalick, HUNTER College; PART I: Genius: Then,Now, Tomorrow, Literacy & STEM Curriculum by 92Y and Discovery Ed • PART II: Genius: Then, Now, Tomorrow, Literacy & STEM Curriculum by 92Y and Discovery Ed; Why Spatial? Spatializing the Curriculum by Dr. Amy Shelton, CTY; Problem-Based Learning by Seth Messier, HUNTER College. In addition to well rounded panels, expert speakers and the announcement of the winners of the 3rd annual Michael Perelstein Memorial Scholarship Fund’s Discover Your Passion™ Competition, the Symposium boasts a Curated Exhibit Hall. A hallmark of the Symposium and touted by past attendees to be “…a wonderful opportunity to engage with the NYC community” the Exhibit Hall will include a sampling of NYC’s finest educational programs and schools. 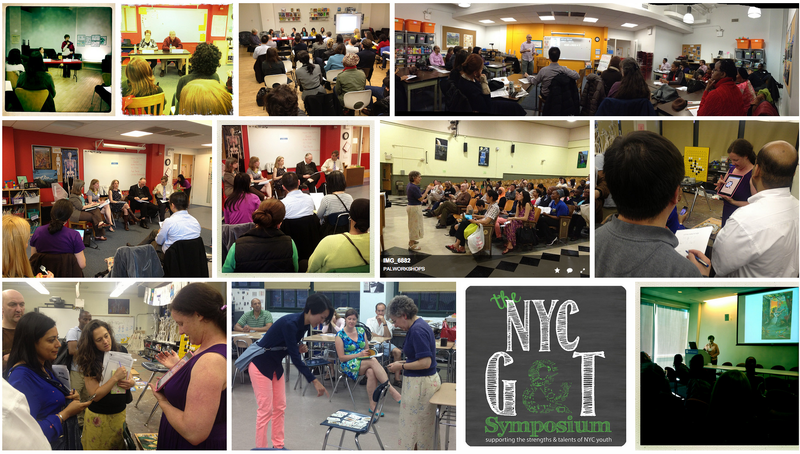 View the The 2016 NYC Gifted & Talented Symposium & Benefit schedule & directory here or click the Agenda below for more details. The symposium is co-sponsored by PALNYC and organized by an advisory committee comprised of select organizations in New York City and beyond, including representatives from a wide range of schools and organization including those that specialize in gifted education. 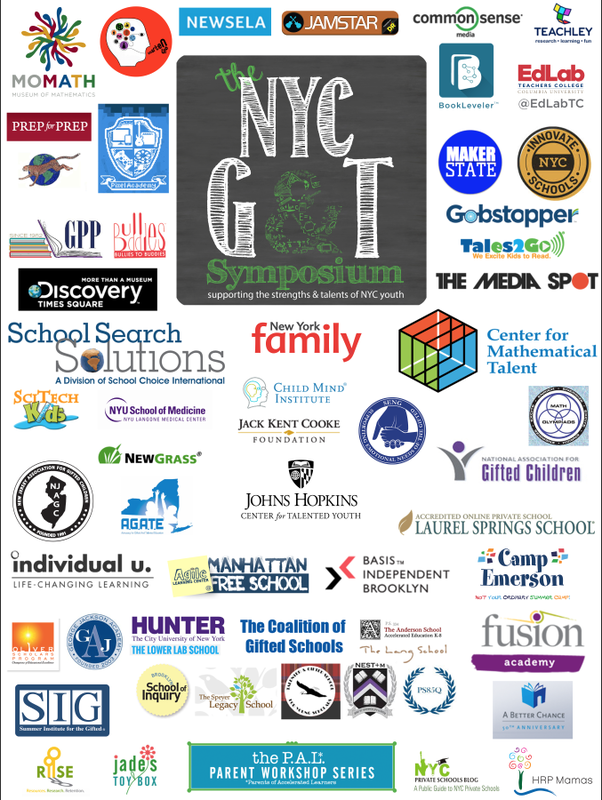 Past supporting organizations of the NYC Gifted & Talented Symposium have included NAGC, AGATE, PACE, NJAGC, RIISE Diversity Recruitment, Common Sense Media and more. Interested in Presenting at the 2015 NYC G&T Right Fit Symposium? The application deadline for presenting at the NYC G&T Symposium has passed. For more information on presenting with PALNYC in the future contact Angelique LeDoux via email at palworkshops@me.com. To view a full list of sessions, speakers and supplemental materials from the Symposium please click here.